How does Creative/ Play Therapy work? Since its first use in the 1920s, Creative/ Play Therapy has been shown to be effective in helping children, adolescents and even adults modify their behaviours, improve self-esteem and build healthier relationships. 10-year research by Play Therapy International (2011) showed that 74%-83% of clients showed positive changes following therapy delivered to Play Therapy International/ Play Therapy Ireland standards. In my own practice, 90% of clients show a significant positive change from pre- to post-therapy assessments. Children and adults experiencing challenging feelings, thoughts or behaviours (i.e. anxiety, aggression, poor communication, withdrawal, hyperactivity, self-destructive behaviours), neurologically speaking act from a stress-driven perspective as their brains are flooded with cortisol. Consistently high levels of cortisol have been shown to affect learning, the immune system and an astonishing array of disorders, from depression, eating too little or too much, and impaired emotional control to substance misuse, physical ailments, reacting without thinking and reduced empathy. High cortisol levels reduce functionality in important self-regulatory parts of the brain, such as the hippocampus (the centre of learning and organisation), the corpus callosum (which allows communication between left and right brain hemispheres, connecting language with sensed experiences) and the prefrontal cortex (fundamental in planning and regulating feelings and behaviour). As such, many people experiencing difficulties feel unable to speak about past experiences and ‘talk through’ their difficulties because they cannot yet ‘put things into words’ as things feel to raw/ vague/ confusing/ disconnected. While society put a value on individuals regulating (controlling) their feelings appropriately, it is often overlooked that early stressful experiences, even if not consciously remembered, affect how our brain makes sense of the world and how we act ‘despite ourselves’. Similarly, events that are experienced as extremely stressful by a person (i.e. loss, separation, major transitions, bullying, events out of one’s control) can ‘overload’ the brain and our ability to cope for a time being. 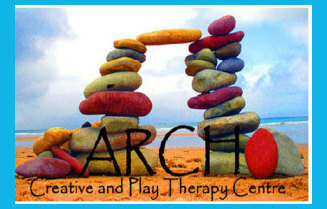 Creative Therapy and Play Therapy help! Creative/ Play Therapy works by supporting individuals, children and adults alike, to regulate and modulate their physiological and neurological stress. This is done by providing a space and relationship where issues can be addressed safely, at the client’s pace and level, reducing feelings that things are ‘too much’/ ‘too scary’ and the need to ‘shut-down’ and use inappropriate ways of coping. Intense feelings are discharged when they are expressed safely through creative media and complete acceptance of and attunement with the client’s process releases opiods, dopamine and oxytocin, naturally reducing stress levels, calming fears or anger, increasing trust and social attachment and increasing readiness for change. This increases functionality in parts of the brain (corpus callosum) that allow us to make connections, put together ‘the whole puzzle’, helping greater self-understanding. This in turn supports greater social understanding, empathy and social skills as well as a sense of well-being. Creative and Play Therapy works regardless of age, gender, ability and experiences. Creative/ Play Therapy is one of the most suitable methods of therapy as Art and Play are natural media of expression and communication. The freedom to act, react, express, create and try new things without fear of consequences (after all, it’s ‘only’ pretend/ on paper, sand or other material) supports changes in neural structures, literally re-sculpting the brain as new neurons and connections are born. New neural pathways are formed as children and adults experiment with new ways of being, growing stronger through repetition. Play and creative work allows individuals to directly visualise their experiences, be it in pictures, sand play, dance or drama, concretising experiences, allowing greater understanding, mastery and confidence. Exploring what feels too difficult to put into ‘sensible words’ is made possible by providing other means of communicating, beyond the need for words and rationalisations. This process in turn allows greater integration of experiences and self-understanding. In short, Creative Therapy / Play Therapy works to change people’s sense of well-being, confidence and coping, in mind and quite literally, in body.